I’m back from my fantastic, amazing, intense week-long portrait workshop with Rose Frantzen, the best teacher I’ve ever had, in Scottsdale, Arizona. I will share my experiences once I have fully processed them and recovered my blogging mojo. Meanwhile, I’m going through caffeine withdrawal again. After months with zero caffeine I needed extra energy to paint 8 hours a day on little sleep for a week. First it was just a morning cup of green tea, then black tea, then an afternoon diet Coke, and by the last day, a morning cup of bad coffee AND the diet Coke in the afternoon. Now, after two days of withdrawal migraines, hopefully I’m over the worst of it. And it was worth it. 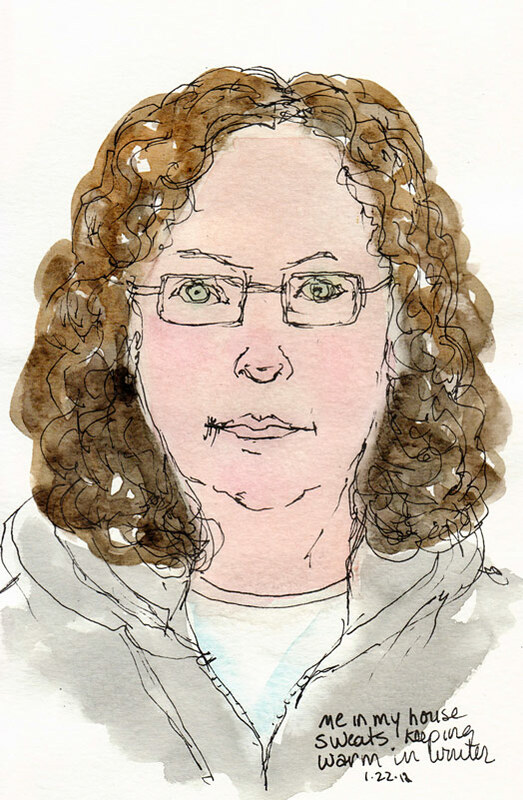 Self portrait with grey sweatshirt, ink & watercolor, 7x5"
I felt like sketching and the mirror was handy so why not draw myself, cozy in my gray sweats. My grandma Gertie had a “house dress” she wore all the time at home and out back to hang her laundry. Just a yellow cotton smock that snapped up the front. I have my “house sweats” that I wear when I’m at home. So comfy and warm. 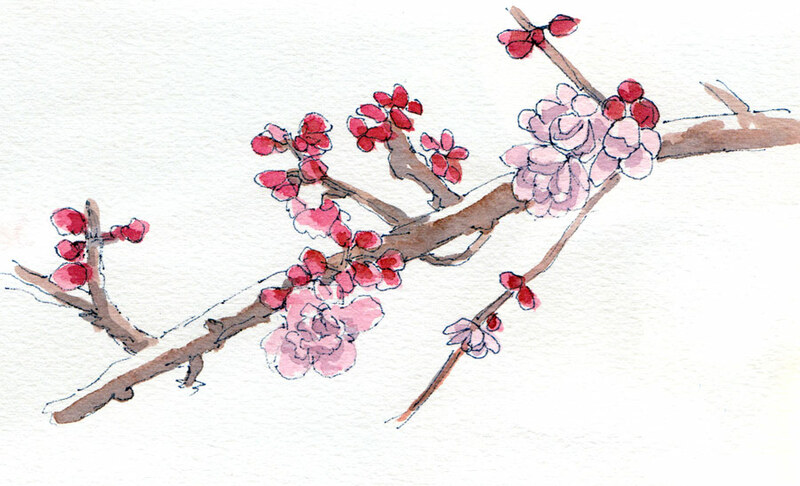 Signs of spring were sprouting everywhere on my walk and I couldn’t resist stopping to sketch and paint. But I stopped so many times that before I’d gone half a mile I was so hungry I had to return home for lunch before heading out again. The sketch above graces the first page of my new sketchbook, bound with Arches 90lb cold press watercolor paper. It’s quite different from the Fabriano Venezia sketchbooks I’ve been using the past year. I’m really enjoying the way the book opens flat, it’s size (7.5″ tall x 5.5″ wide) and weight, how comfortable it is to hold and to hold open for working across the spread, the texture of the paper for painting and the way the pages don’t ripple, pill, or show through to the other side. The paper takes a lot of abuse and layering, which is both a good and a bad thing. Good because it holds up, but bad because it allows endless diddling around which isn’t really the point of sketching (but is a bad habit of mine). 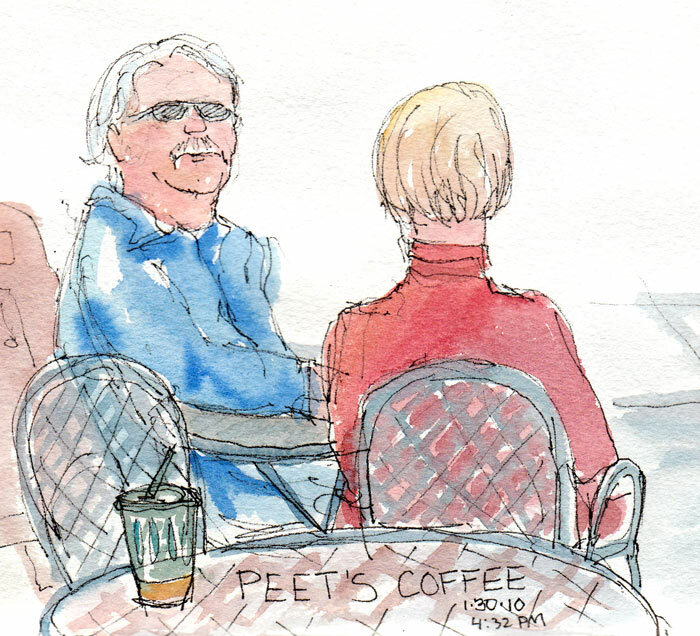 And what’s a nice walk on a spring-like day without a stop at Peets for a Cappuccino at a sidewalk table and a bit of sketching/painting. I’m still finding my way with this paper, trying to get a sense of how much paint to use, and which pens work best with it. 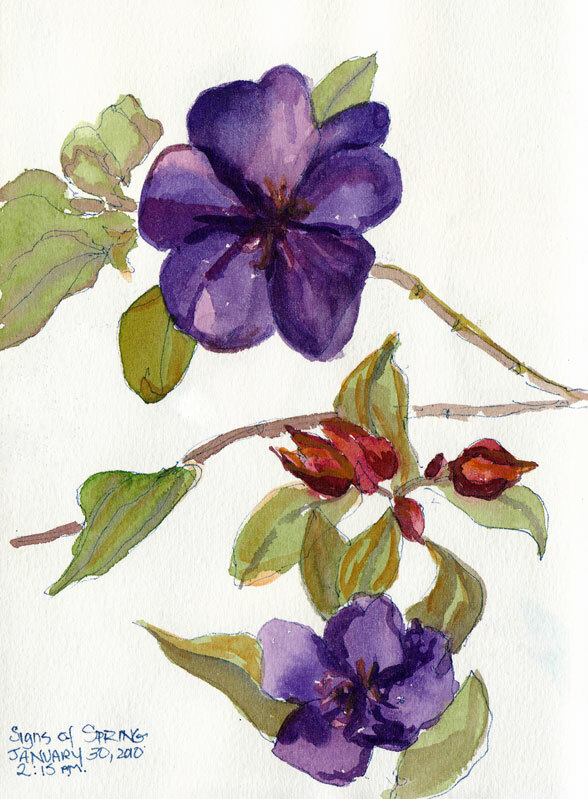 One thing I’ve determined for sure is that I prefer painting on site when I go out sketching, as I did with these, and not just drawing on site and adding paint later as I did last week with my sketching group. I just spent the evening painting the drawings from last week’s outing and it just didn’t have the zing that painting from life on site does. You can make many more sketches and have more control of the paint when you save the painting for later, but then you either have to work from memory (of which I have too little) or photos (which never capture what you really see in person) or by using a pencil to softly write “Y” in areas that are yellow, “B” for blue, etc.) While I loved those “paint by number” kits when I was a kid, I’m not crazy about painting by letter now. 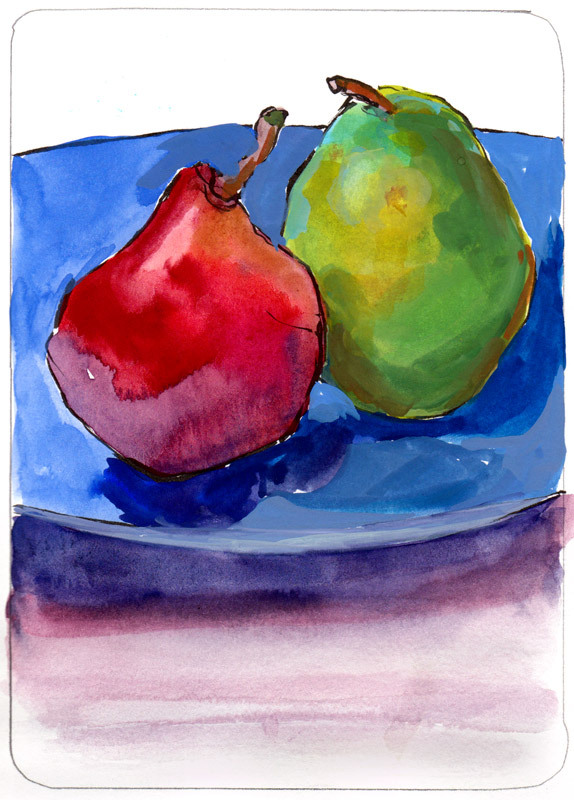 Pears on a Blue Plate, Pentel Pocket Brush Pen and gouache, 7x5"
In the week and half since I gave up sugar and Splenda, pears have become my new treat. Not only are they crispy, sweet and delicious but they come in such pretty colors too. This sketch is a celebration of their gifts. 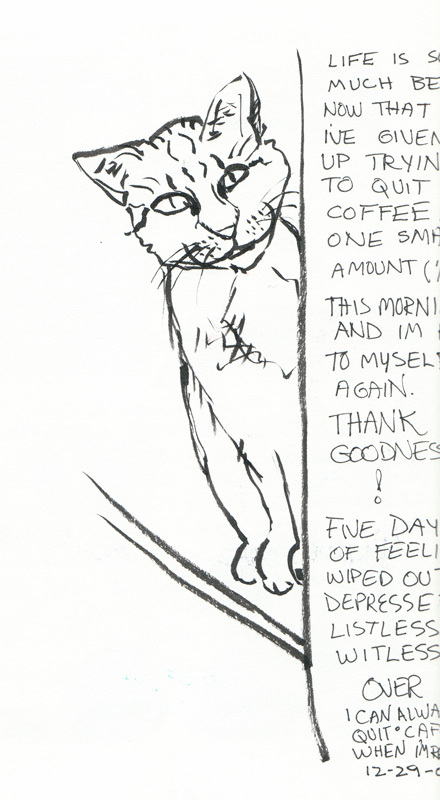 But meanwhile, giving up coffee didn’t go as well…. After five days of feeling wiped out, depressed, listless and witless I couldn’t take it anymore and finally had half a cup of coffee. That’s all it took: within a few minutes I was back to my old inspired self again and the blues were gone. Yay! Maybe I’ll try to quit caffeine when I’m retired in a few years, but for now, each day is too precious to spend feeling like a zombie. I like to use my winter holiday vacation as a time to review my past year and sort out what I did well and what needs work. Since this is also the end and beginning of a whole decade, this process felt even more important this year. One thing that really stood out was that I needed to kick my caffeine habit and its evil companion, sugar (both fake and real). So, after a week of being foggy-brained, sleepy and witless, I’m now free of caffeine, sugar, and Splenda* and finally starting to feel good and my inspiration is returning. Without the sweeteners, decaf coffee and tea were tasting pretty vile to me so I began the search for a flavorful herbal tea with at least a hint of sweetness. I finally found a couple that I like but in the meantime spent a fortune buying seductively-named but ultimately insipid teas that taste like something you might use to clean windows. Splenda is made from cane sugar by replacing three hydroxyl groups on the sugar molecule with chlorine. The resulting molecule is not recognized as sugar or a carbohydrate by the body and as such, is not digested. Some refer to Sucralose as Chlorinated Sugar. Sucralose does not occur in nature. Eek! I’m embarrassed to admit how much of that stuff I was consuming! This is what I look like far too often these days as I’ve gradually been reducing my caffeine intake. I’m down to one cup of 25% caf & 75% decaf in the morning and then nothing but decaf after that. 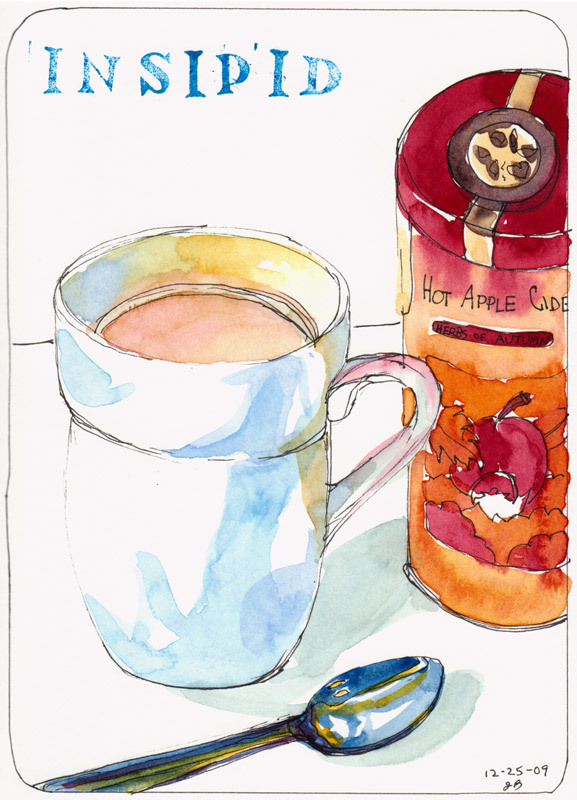 My painting ritual had been to make a cup of coffee before heading into the studio and bringing an entire vacuum pot of the stuff when I went out plein air painting. 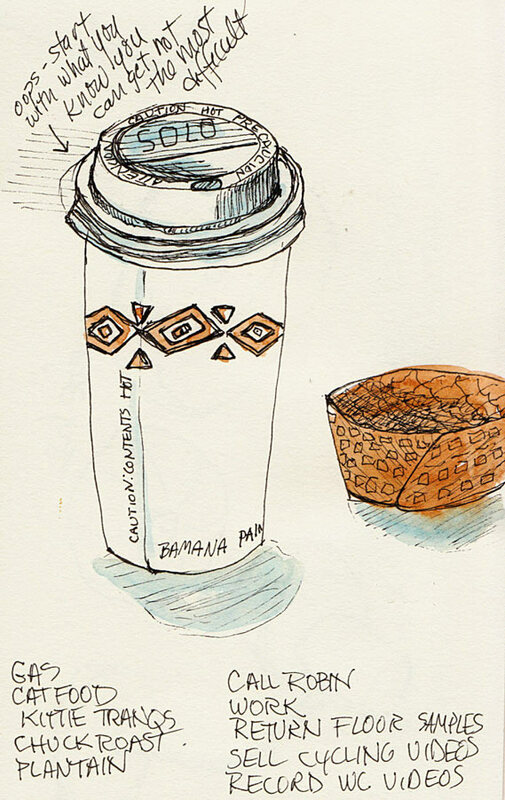 The extra energy from caffeine not only kept me painting when I should have been sleeping, but it also fueled my late night blog visiting and email answering. It was fun having that artificial boost, but burning the candle at both ends was doing bad things to my health. While I miss the energy, I am sleeping at night now and waking up feeling alive and ready to go instead of feeling like my head is full of mashed potatoes. Yes I was squeezing extra hours out of the day but I was paying for them with being constantly sleep-deprived. I asked a friend who doesn’t use caffeine what you’re supposed to do when you’re tired if you can’t drink coffee, thinking she’d have some other trick for keeping going. She looked at me perplexed at what seemed like a silly question. 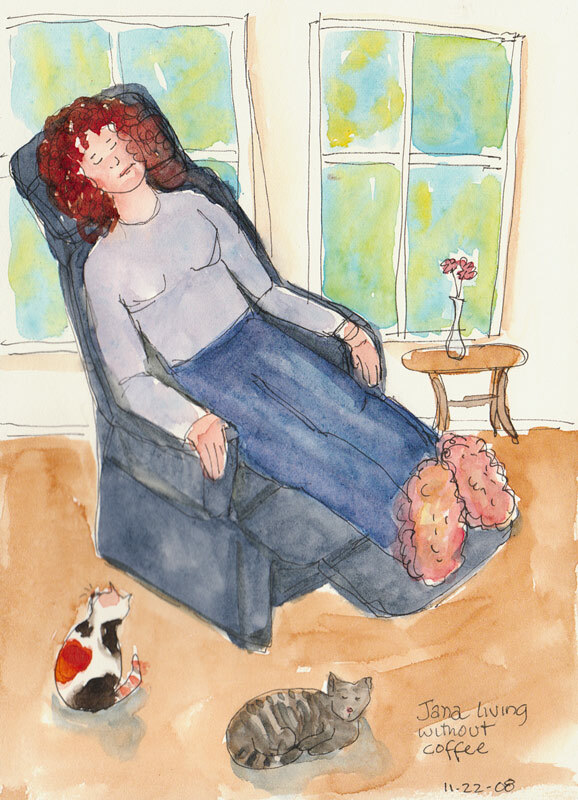 “You rest!” she said. What a novel concept!